Dalida (January 17, 1933 – May 3, 1987), was a famous singer and actress born in Egypt with Italian parents but naturalised French. Dalida performed and recorded in more than 10 languages including: French, Arabic, Italian, Greek, German, English, Japanese, Hebrew, Dutch and Spanish. 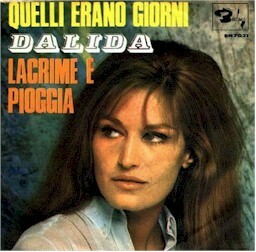 Her debut album "Son nom est Dalida" was released in 1957.